Chila Kumari Burman’s work spans multiple media, from printmaking and painting, to installation and film. She has been a practicing and exhibiting artist for more than 30 years, and has pieces in the Tate, Victoria and Albert Museum, Scottish National Portrait Gallery and the Wellcome Trust, as well as numerous international institutions. Her subjects are selfidentity and the politics of representation, which she expresses through an exploration of her own British-Asian background and cultural notions of femininity – big themes treated with playfulness, accessibility and an explosive sense of colour. While she has long been recognised as a leading British-Asian artist, Burman is now receiving broader acclaim for her use of self-portraiture to question the identities we construct and present to the world. Burman was born in Liverpool, to Punjabi parents who moved to the UK in the 1950s. She discovered a love of art at grammar school, and it was her teachers who encouraged her to study a foundation course at Southport College of Art and Design. She followed this with a BA in Fine Art Printmaking at Leeds Polytechnic (now Leeds Metropolitan University), then an MA in Fine Art at Slade School of Art. She has worked with students on the MA programme at Camberwell College of Arts, while a 2014 exhibition of her work was curated by Professor Paul Goodwin, director of the TrAIN Research Centre UAL. A celebration of punk attitude and Punjabi heritage, Bollywood glamour and her working-class background, Burman’s work challenges convention and leads a discussion of how art can embrace diversity and difference in today’s world. 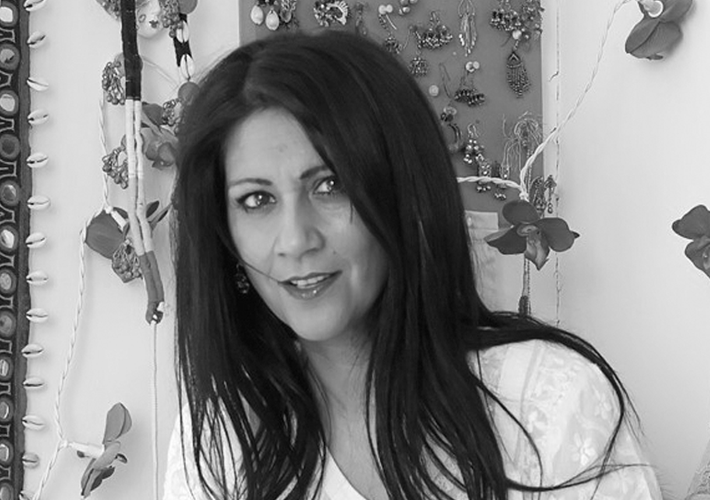 Just some of her notable achievements include being one of the first British Asian female artists to have a monograph written about her work: Lynda Nead’s Chila Kumari Burman: Beyond Two Cultures [1995; 2012] and ART CHENNAI Artist in Residence . Most recently she was commissioned by the Science Museum to take part in Illuminating India.